Before you buy a Ubisoft game from Steam in India, there are some things you need to research. 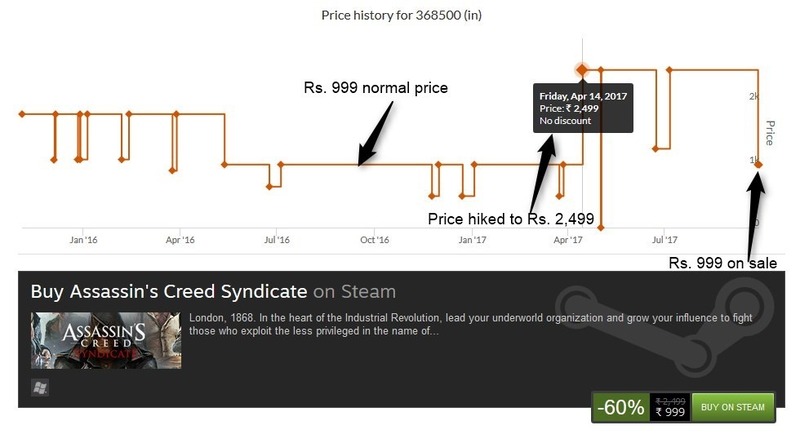 As you will be familiar with, Steam offers regional pricing in India. It has been doing so for a couple of years. This enables game publishers to price their games according to the economy of the region, for example a $59.99 game (converted to Rs. 3000+) on Steam, will be priced at a much more affordable price of around $20 or less. Now, this clearly shows that Ubisoft views the Indian gaming market on Steam as the same as the US. Let me go out of the way a little bit, and dispute an illogical argument made, by many gamers who justify the prices as fair. A very often criticism made by US gamers is that $5 is the price of a cup of coffee, and you are complaining that you can’t spend that on a game which you will play for hours. They are ignorant by imagining that the price of a cup of coffee, costs the same everywhere. How much is $5 in Indian rupees? 1 US Dollar equals 65.56 Indian Rupees, which makes $5 = Rs. 328. A good cup of coffee from a well furnished, hygienic hotel in India costs anywhere between Rs.30 to Rs. 80 or more(depends on how famous the hotel is). If you go to the Taj Mahal Hotel in Mumbai, you can order a cup of coffee or tea for $5, and that is considered a luxury. So, whenever someone quotes a game price to a cup of coffee or a Happy Meal, quote this, and prove them wrong. This is not a real way to view a Country’s economy. Look at smartphone prices for example, and see which ones sell the most. It is the budget friendly ones which make money. Coming back to topic, do you think the Ubisoft pricing of games in India, as equivalent to those in the US is fair? No, but there is more. Ubisoft's regional prices weren't always the same in India. Earlier it used to be very reasonable, until late March or early April 2017. That is when disaster struck, and Ubisoft doubled the prices of its games in India. Assassin's Creed Syndicate is available for Rs. 999 with a 60% discount off the normal price of Rs. 2499. The historical lowest price (thanks to SteamDB for the info)was Rs. 499 at 60% off of the Rs. 999, which was the normal price before the price hike in India. The game saw a 3x price hike, do you still think it is fair? A similar price hike was made by Paradox Interactive, of (Crusader Kings, Europa Universalis, Stellaris fame), and it was met with a severe backlash from users. Later the CEO apologised and rolled back the regional prices to make it fair for gamers from weaker economies to buy their games. While we won't ask you not to buy Ubisoft games, it is our request to consider not supporting these unfair regional prices. Instead buy the games from Humble Bundle, or other retailers listed on IsThereAnyDeal, where you can get much better discounts if you have the patience to wait for a sale. And as a rule, always visit Steamdb, to see the historical price of a Steam game in India. See if the current sale is the lowest, or when it ws the lowest. You can also see whether a game’s price was permanently increased or decreased using the timeline chart.